Doug: Welcome to the 5th quarterly edition of the Super Blog Team-Up, a massive collaboration across the blogosphere and podcastosphere (say what?). We're glad you've dropped in, and if you're visiting from another site and are making your inaugural journey to the Bronze Age Babies then we say "Welcome!" Don't be a stranger -- come back often and get in on the conversations. Most importantly, leave us a comment! Doug: This time around, the topics du jour are multiverses and alternate realities. As you may or may not know, this blog is pushing six years of publishing history, so we've dealt with these sorts of things on many occasions. As you may also know (a quick peek at our masthead should have been the first clue), we're taking our annual vacation from new material and are instead featuring some classic posts from our backlog. Wanting to stay true to ourselves, then, we're going to direct our readers to a "greatest hits" series of comic book reviews that should satisfy anyone's multiversal appetite. NOTE: Feel free to leave comments either on this post or on all of the posts linked below. We have a "recent comments" widget on our sidebar that will direct visitors to today's action. NOTE #2: We've only linked you to the first issue in each storyline. You should be able to navigate through the remainder of the series by using the "You might also like" feature at the end of each post. Memorable scene - Wanda being possessed by the Serpent Crown and flat-out talking nasty to the Vision. Vizh took out his frustrations by phasing through Hyperion's chest. Key comment - Karen: Beast served as a mouthpiece for Englehart to make some social commentary. It would probably be considered heavy-handed now but considering where the national psyche was at in 1976, I think it fit in perfectly. "We commit the most outrageous acts...and you go right along, pretending not to notice!" Actually, much of that speech still resonates today. Memorable scene - Alicia relates her story and asks how it is that Ben is now with her -- he assures her that he'd been in the Great Refuge with the rest of the team. Alicia is very upset, and produces a scrap of the other Thing's shirt as evidence of what she'd gone through. Ben gets an idea, and calls up Crystal on the omni-viewer. Of course Quicksilver is right by her side, and abrasive as ever. Ben brushes him off and asks Crystal for Lockjaw's services. No sooner is the connection cut than the big pooch appears. Dimension-hopping time, friends! Key comment - Karen: This illustrates again why I have never liked Reed Richards. Besides lobotomizing his son and treating his wife like crap, he rules the FF with an iron fist! "I own 51% and controlling interest -so what I say goes" -that's just typical of Mr. Big Brain. Oh sure, it may turn out he has something up his sleeve, but he's gonna put everyone through hell before he's done. Memorable scene - Looking through the book with a discerning eye, trying to find all of the "corrections" done to Ross Andru's art. Key comment - Doug: I guess, looking back on what must have gone on in those smoke-filled rooms at the meetings between Stan and Carmine (and all of their other assistants), Gerry Conway did a good job with what he had. I mean, there aren't any risks at all taken here -- everyone's in their firmly entrenched characterization, neither company's character really gets the upper hand over the other's (although I'd certainly argue that Ock got the short end of the stick in the bad guy dept. -- he comes off looking pretty inept), and even the supporting casts are pretty vanilla. But I keep coming back to -- what would I have expected? Memorable scene - The Legion is invited to the Kents for dinner while they wait for Clark to return home. Ma stuffs them with a big country spread, and suddenly Clark walks in. The team is really excited to see him, as again -- they'd thought he never existed (in spite of their own memories). But Clark's reserved, and quickly invites the Legionnaires to the basement to talk while Ma cleans up the kitchen. Clark distracts them by directing their attention to a shelving unit with statuettes of the Legion members. But while their backs are turned, Clark pulls out a device that looks like the Phantom Zone projector; instead, it's a Time-Stasis ray and freezes the teen heroes in their tracks. Key comment - Doug: For my money, this was all very poorly imagined, executed, and bordering on plain ol' stupid. As Superboy had never existed on Earth-2, and as the Legion was going to be kept around (although from the post-Crisis onward, endlessly rebooted), I failed then and do now to see the necessity of this "housecleaning". While DC through the years has had many corners of their universe supported by rabid fan support, the Legion seemed to hold an almost cult-like loyalty among its adherents. This seems to have been a kick in the teeth and a "We don't care" from editorial toward longtime Superman and Legion of Super-Heroes fans. Memorable scene -The Deathlok series (which ran from Astonishing Tales 25 to 36) was set in a dystopian future, ruled by corrupt military and corporate leaders. Colonel Luther Manning is killed in combat but brought back to life as a hideous cyborg (for some reason, his face always takes me back to that grade Z 50s horror flick, I Was A Teen-Age Frankenstein!) to do the dirty work of Major Simon Riker. Riker had Manning rebuilt with steel-re-inforced limbs and a computer brain. In fact, he had surgeons keep only a small portion of Manning's brain, supposedly the part that made him a brilliant tactician. However, Manning retains his personality and is able to assert dominance over the computer mind, and break free of Riker's control. In this issue, we see him working as a freelance mercenary, cutting down two men in cold-blood. The story of how he became such a ruthless killing machine is told in flashback. Deathlok was one of the first of that wave of anti-hero characters (including the Punisher, who also debuted in 1974) who would change the face of comics forever. Key comment -This issue gives us the origin, but there would be so much more to follow. It just scratches the surface. Especially compelling was Manning's struggle to find his wife and kid - although with predictable results. The concept may not seem so novel now, but back in 1974, believe me, it was. Sure, we had The Six Million Dollar Man on TV, but Steve Austin was a pretty normal looking guy, leading an appealing life. Not so for Deathlok. I think Robocop probably owes its existence to Deathlok, and it surely has been an influence on other works. Memorable scene - JJJ and his paper have paid the way for Dr. Doom to address the United Nations at a world conference on terrorism. Yep -- invite a totalitarian dictator and renowned terrorist himself to discuss how to bring that phenomenon to a close. 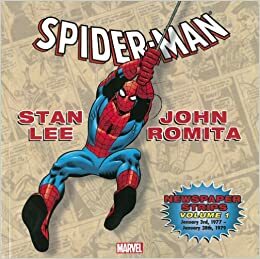 Key comment - Fred W. Hill: The Spidey strip was in the local paper my dad subscribed to, so I got to read the first few years worth of stories. Certainly fun but eventually I got bored with it, even when I was still gung ho on the montly comics. Spider-Man is much better suited for comic books than strips, IMO. Stan, however,is very wise in keeping the strip separate from what's going on in the comics -- I have a hunch that having Aunt May on the verge of death and Pete making a deal with the devil to save her at the cost of having his marriage to Mary Jane cease to have ever existed would strike most of that dying breed of regular newspaper readers as spectacularly stupid storytelling. The sort of idiocy Stan strove to avoid when he was mostly in charge of Marvel during the Silver Age. Memorable scene - And then... things turn zanier yet. The Flash, realizing that the power of light and radiation caused a chink in Bork's armor, grabs the totem once again and begins towing it -- right into the sun! No transuit, no protective aura, nothing. Just running. Into the sun. Memorable scene - Kamandi himself is a cipher. He leaves his underground bunker (Command D -get it?) where he lived with his grandfather, to explore the world above, a world he had only known through stories and microfilm records. When he returns to his home he finds his grandfather killed by invading wolf-men. He decides to continue his explorations, but there never seems to be any rhyme or reason to his travels. He never expresses a personality beyond being something of a hot-head. There's no emotional life to the character. I'm not saying every comic character has to be a Peter Parker and cry in his beer every issue, but there has to be some sort of inner life, something going on that drives the protagonist and makes the reader take an interest in them. There's just nothing there with Kamandi. He's a blank slate. He seems to exist only as a vehicle to move from one place to another, from one idea to the next, so that different concepts can get shown off. He has no stake in anything. Key comment - Despite all of this, I do find Kamandi oddly compelling. I'm even considering buying the second Archives edition. Part of it is just this desire to see if anything really evolves out of this beginning. There's so much potential for story-telling. But without a central character to care about, it's just so much fluff. Kamandi (the book) is like a fast food snack when it could be a great four-course meal. It's kind of fun but ultimately it doesn't satisfy. I'm hoping that later in the series it turns around and gains some substance. Memorable scene - ...and as Wolverine sought to intervene, new team leader Storm swept him from the fray. Mad, claws drawn -- not gonna fight that way, said Ororo. Key comment - Karen: It's interesting in this future sequence that Rachel says she's not certain that what Kate does in the past will definitely change their own time stream -it might just create a different timeline. Isn't this always the problem with time travel stories? Can you really change things? Doug: Thanks again for coming by today. If you left a specific comment on one of our classic posts, we're grateful. But if you'd care to leave some general thoughts here on multiverses and alternate realities, we'd love to hear that as well. Come back soon, and be sure to patronize the other great blogs and podcasts in today's SBTU. Apparently Marvel are planning to merge all the multiverse versions of the Marvel universe into one - so the Ultimate universe will be merged with ours etc. Yeah, Colin, I'm just not following any of that stuff anymore. Is DC doing the same thing again -- or the opposite? I saw on Twitter some folks discussing a "Multiversity" project from DC? Available on Comixology...? Edo -- the issue with Gaard (FF #163) was among the very first comics lil' Dougie purchased with his own quarters. I don't even know if I was sports savvy enough way back then to even recognize him as wearing hockey equipment. But I know when the big reveal of his true ID came at the end of the mag I had a hard time wrapping my brain around it. I was really happy that Karen reviewed Kamandi here, and all the comments that came out of it. Geez, Colin, I hope they're not THAT dumb. That "merging of the multiverses" never lasts for long, if what happened at DC after Crises is any indication. Sooner or later we're gonna see dimension inflation, and Supergirl and Superboy are gonna show up again...no, wait, that was D.C.
And actually, I like the idea of parallel universes. Maybe Gaard the Cosmic Goalie wasn't the best idea, but the Multiverse made for some good stories. When I was seven, I kind of scatched my head over the whole Earth-1 Earth-2 deal, but I eventually doped it out. Just purchased several back issues of Kamandi from my local comic store this weekend. When Kirby was playing within the DC verse proper I always felt a little nervous, like I was watching a baby play with an Ultimate Nullifier or something. It was difficult sometimes to resolve what was going on with the greater whole. With Kamandi it was a bit easier, there was no chance of continuity being trampled on and it's very easy just to pick up a book and get in the groove. "Like a baby playing with the Ultimate Nullifier." To a kid growing up in the deep West of the South, New York City was as much an imaginary place as Gotham or Metropolis, or Star City or whatever the other places were. Accepting a world where OUR heroes, and by that I mean Marvel, didn't exist was not that far of a leap. Counter-Earth, Earth Prime, Earth 2, Earth 616, Asgard were all the realities in my comic books. I think it also helped that in DC, some of the characters were the originals and some were the ones who later took up the mantel. Was a bit confused by Supergirl/Power Girl, but I "doped it out". (Mawage. Mawage is wot bwings us togeder today. Mawage, that bwessed awangment, that dweam wifin a dweam...). Powergirl was the one with the rack. I was glad Kamandi brought such lively discussion here. I still have mixed feelings about it, but I don't regret buying those two volumes, and I might buy more! I really liked the Kamandi volumes one and two ...that is the omnibus hardcovers I bought a couple years ago. I was very surprised when I read them because it was the first time I did. I never bought them when they were originally released in comic form. After buying I went and got the Demon, Omac, and all four of the New Gods omnibus editions. Being new to Kirby's seventies work at DC, I can tell you these books will be read more than two or three times because I can't get over Kirby's spectacular art. I really think he set the standard for all Marvel and DC super heroes and as a cartoonist there is so much that I learn just by looking at his art. The contrasts, the thick and thin brushwork. Call me old fashioned, but I cannot get into the new Marvel and DC books. I get the animated movies when my budget allows. However the updating of some of the characters and the direction they are taking to modernize them completely leaves me at a loss. They have become a parody of what they were in the 1970's. There are a few exceptions like Alex Ross's work. The comics of the 70's were special because they didn't have a corporate entity looking over their shoulder each issue. They weren't trying to extend stories for the trade paperback or movie...they were just making comics. Darn, that's a lot of Greatest Hits content -- I'm envious! And I'm also off to read your comments on Days of Future Past (which was the subject of my own Super-Blog Team-Up entry) and Kamandi, which I am blogging about next week! Thanks for being part of another Super-Blog Team-Up!